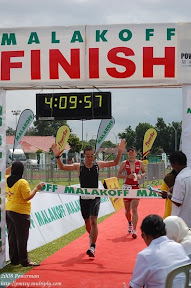 I've received the full results of the 28th Panaga Triathlon. My official time is 1:23:44, 4 seconds behind my unofficial time. Congrats to Ahmad Fathi for beating me with a time of 1:22:26. A difference of 1.18 mins. Next year I'll try to 'sayur' you. It's no one to blame. Everyone including me thought it was a 2 laps bicycle race just like the previous years but this year they change it to 3 laps due to road diversion. I was also lazy to read the notes that was given and didn't attend the briefing. Luckily for me, I went back to Seria the week before and saw the road diversion at one of the cycling race route. If there is a road diversion, then there would be a change in the race route. I checked back the notes - it was change from 28km to 24km thus 2 laps becomes 3 laps. I've also post it on my previous post of the changes and I've also told a few of my friends before the swim. If not banyak orang membuat 2 laps saja. How do i know. I'm not going to mention names or BIB numbers, sendiri sendiri tah kamu meng analyse the results. You can check by checking the start swim, end swim, start bike and end bike and try to remember who you pass by during the bike leg or who pass you by and also try to remember their BIB number because everyone start according to BIB numbers. I know my start bike and I remember around 3 to 4 cyclist pass me by (they are very good cyclists, strong leg power) and I also remember to pass by a few slow cyclists. Hopefully, by next year event - i guess around May 2009, they will inform very clearly lah of any major changes of the distance and number of laps. - race like this, its basically a time base race where you compete against the time not with other competitor because you don't know who is who leading. You only know the winner after they total up the time. You race against your selves. tahniah bro. so bila target nak masuk Ironman?